It has been over four years since I switched to the Fujifilm mirrorless system. I have watched people switch to Sony, back to Nikon, back to Canon while I sit in my blissful little world of a camera I truly love using. I do not worry about having a full-frame sensor with the most megapixels, etc. Cameras are all great today, and the Fujifilm X-T3 is no exception. Note: All the images in this post are taken with the X-T3 and you can see full size versions by visiting this link. I hear the question all the time “is the Fuji good for landscape photography?” I can answer this with a resounding YES! I’ll just dive right into the details of why it is a great camera for landscape photography. This may not qualify as a ‘feature’ but to me it is one of the most important factors, and a big reason I switched in the first place. Everyone talks about ‘going mirrorless’ to save weight, but the reality with all full-frame cameras is that you are only saving a couple ounces in most cases. This is because the lenses stay the same size and this is where most of the weight comes from. Because the X-T3 has a cropped sensor the lenses can stay quite small. My hiking kit consists of the X-T3 with three lenses; the 10-24, 18-55, and the 55-200. Covering a range equivalent to 15-300 on a full frame. All of this only weighs 4.07 pounds. There are a lot of naysayers when it comes to the Fujifilm X-Series for nature photography. Yes, it has a cropped APS-C sensor and ‘only’ 26.1 megapixels. You are made to believe that your images are terrible if you’re not shooting with a full-frame camera that has at least 45 megapixels! The reality is that cropped sensors have come a long way and they are incredibly capable these days. Megapixels are a ridiculous metric that people continue to chase, it seems there are never enough. Do you really need all those MP’s for something you will post to the web at 1500px? Do you really need them for a 30×42 print that if you step back from and view at a reasonable distance you will never know the difference? Photographers tend to focus more on the gear rather than the meaning behind an image. Let’s deal with the 500 pound gorilla in the room first; worms. If you have done any research you have surely come across the discussion of X-trans sensors creating worms when sharpening, especially with Photoshop or Lightroom. It’s somewhat true that Adobe has done a poor job of processing X-trans files, I wish it was better. But, it’s not the end of the world. I use Lightroom to process all of my images and am very happy with the results. I have found that the detail slider (for Sharpening) in Lightroom is what causes worms, in fact it does this with most cameras and should be watched carefully, it’s just more apparent with the X-Trans. The setting I use for sharpening is an amount around 100, Radius of 0.8, and Detail of 0. This gives a subtle amount of sharpening that removes the softness from a raw file which is what you want. There are a few scenarios where I have to use an add-on product to help alleviate the worms, if I have an image with a lot of fine detail, or when dealing with foliage. You do end up with a mushy mess when working with foliage in Adobe products. The easiest solution is to use Iridient X-Transformer which will process the raw file for sharpening and noise reduction, then bring a DNG back into Lightroom where you can do your final processing. It’s a fairly painless process and it’s not like I’m converting every single image, just the very best. If you’re not a pixel peeper you will likely never notice the worm issue using the settings above. The other options are to use Affinity Photo, Capture One Express Fujifilm, or RAW Therapee, all of which do a great job processing X-Trans files. Dynamic range is still good on the X-T3, it hasn’t changed much from the X-T2, just better at ISO 160, but nothing you would notice in most situations. I have no complaints with the DR, it is quite close to the D850 and it’s still always better to blend images for maximum quality if that is your concern. I have put the X-series cameras through their paces in all sorts of ridiculous conditions and have been very impressed. Once I was photographing plant oils in the Zion Narrows and managed to knock my tripod over due to a floppy tripod leg, which sent my X-T2 hurdling into a pool stagnant algae filled ‘water’. As I retrieved it there was algae falling off along with the muddy water, total nightmare. When I got back to camp I had no choice but to rinse off the camera with fresh water and hope for the best. I rinsed off all the gunk and then put it in a ziploc bag filled with silica packets (rice would work as well), I left it in the bag for several days to fully dry and after that, it was good as new! I also recently spent a week in the Tetons and Yellowstone in the winter using the X-T3. Overall it performed very well in the extreme cold, but did have some hiccups when it hit -24 degrees. On the coldest morning the camera actually reset itself while changing a battery. Obviously the capacitor in the camera was quickly depleted due to the extreme cold so I lost all of my custom settings, which was a bit frustrating. This was the only issue I had in the extreme cold besides batteries dying very quickly, but this will happen with any lithium battery. When the batteries get too cold the camera shows them as empty, but after warming them back up with hand warmers they show fully charged again. 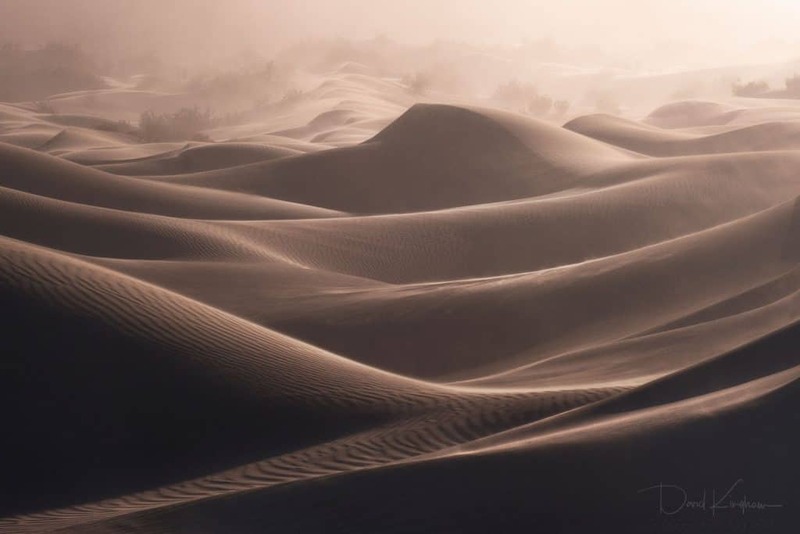 I have also subjected it to sand storms on the sand dunes in Death Valley with zero problems. A concern many people have about transitioning from a DSLR to mirrorless is losing the optical viewfinder. This was a legitimate concern when mirrorless first came out, but since then the electronic viewfinder has evolved by leaps and bounds. I could not imagine going back to an optical viewfinder now! Some would argue that you are no longer seeing ‘reality’. I would argue that what you see in the viewfinder is much closer to what you would get in the final image, which is what is really important is it not? I love being able to set the white balance and exposure to see almost exactly what I’m going to get after I click the shutter. It is exceptionally useful when shooting Black and White as I can set the Film Simulation to ‘Acros’ which is a black and white film simulation that is quite contrast-y. Seeing B&W through the viewfinder makes it much easier to visualize compositions. Other benefits are not having a dim display with a slower lens, no annoying dust spots on the mirror, and possibly best of all, a histogram in the viewfinder. The focus peaking on the X-T3 works very well but no better than the X-T2. This is a very useful feature to see exactly what will be in focus based upon your focal length, aperture, and focus point. You can change the color of the focus peaking to make it more visible, I usually have mine set to red which stands out against most nature subjects. If I am doing manual focus stacking this feature makes it so easy as you can quickly visualize what is in focus and what you need to focus on in the next image. This is a feature that was added to the firmware of the X-T2 as well and is incredibly useful if you focus stack a lot. You will find this in your bracketing settings. You tell the camera how many images to take and at what interval, this takes some experimentation to figure out what works for each subject. After you input your settings you simply focus on the object that is nearest in your frame, hit the shutter and it takes the amount of images you set until the focus reaches infinity. There is not much information out there on the DR of Fujifilm cameras because they are not measured by DxOMark. While I have no way of measuring this, I have compared the files to other heavy hitters like the Nikon D850. I have to say that the X-T3 holds its own, you can pull the shadows quite extensively without getting noise. That said, all new cameras today have great DR, it is more important is getting a properly exposed file. Dynamic Range should not be your primary concern anymore. As stated in previous reviews the Fujifilm lenses are a work of art. They are all incredibly sharp and I have no desire for new lenses. Here are the lenses I would recommend, I prefer zooms over primes myself. If you are looking to upgrade from the X-T2 you have a tough choice on your hands (here is my review of the X-T2). The X-T3 is a fairly minor upgrade for landscape photography. Fuji put a lot of effort into making the video features and quality outstanding in this version. They succeeded in this regard as it is considered one of the top cameras for video now, but I won’t be focusing on that in this review. Here are the new features I have found to be important for landscape photographers. It is nice to be able to just touch where I want to focus. I have mine set to only focus and not take a picture as I find that to be frustrating to accidentally take photos all the time. I found the swiping features to no be implemented well, I was constantly swiping by accident so I turned this feature off after a while. It needs to be more of a deliberate swipe all the way across the screen to prevent accidental swipes. I feel like Nikon has done a better job at implementing the touch screen overall. Knowing Fuji, this will be addressed in future firmware updates and we will continue to see improvements. At this point in time I would not be heart broken if I lost this feature. The pinch to zoom feature is nice to have, but the eye sensor often interferes with this. Automatically sets the time to match your phone, no more worrying about changing for daylight savings or different time zones. Makes it easier to connect to wifi. There are some features like downloading photos and having complete remote control that can only happen over wifi. The good news is when you are already connected via bluetooth it only requires one click to connect to wifi after the initial setup. Firmware updates – this is so handy. When you open the Fujifilm app it checks for firmware updates and downloads them to your phone, it asks if you want to install it, then connects via wifi to complete the update, wait a few minutes and boom, you are done! The Bluetooth automatic connection does need to be improved, I don’t think my phone has ever automatically connected even though I have that setting turned on in the camera. My Beats earbuds always connect, why can’t the camera? The AF on the X-T3 is truly exceptional. It is one of the best on the market if not the best, right up there with the Nikon D500. This is not terribly important for landscape photography except when you get into low light situations. I love to photograph during twilight when there is a beautiful glow on the land, but it can be very challenging to focus when it is almost dark. I have been blown away by how well the X-T3 focuses in these conditions. While my friends with Nikons and Canons are packing up because they cannot focus anymore, I am still nailing the focus even though I can barely see with my eye, insane! If you ever shoot moving subjects outside of the realm of landscape photography, the AF is unbelievably good. We photograph dolphins each spring on a moving boat, it is a challenging situation with the dolphins erratically moving in and out of the frame quickly. I recently tried out the X-T3 photographing dolphins and used the pre-shot feature to capture images before I even press the shutter (this only works with the electronic shutter). Incredibly it nailed almost every shot even when I was quickly bringing the camera up and firing before I was even looking through the viewfinder. The Pre-Shot feature allowed me to capture moments that I would have otherwise missed with any other camera. Combine this with 20fps using the electronic shutter and it is an amazing experience. The sensor is now backlit, which means it can collect more light. The biggest advantage of this is low light focusing performance, AF works better and the display looks better for manual focusing which means less noise and better colors. Image quality is slightly improved, but to such a small degree that you won’t notice it in reality. ISO 160 – The new low base ISO has been lowered to 160 instead of 200. Relocated port for shutter release cable – they moved it to the right side! This is fantastic news if you use an L-Bracket, no more fumbling around to connect the cable through the L-Bracket. The buttons are all more tactile and have a nice click to them. The dials have been slightly redesigned and have a better feel overall. The exposure compensation dial has been made smaller, some may like this to avoid accidental turns of the dial. I personally dislike it because I cannot change it with just my thumb now, it takes two fingers, but it’s a minor annoyance. The new NP-W126S battery has a higher capacity and I have noticed the battery lasts much longer now. The latch on the flip screen has been improved so you no longer have to slide a switch down to open it, now it is just a pull lever that is very natural to use. There are some small things that annoy, admittedly they are very minor. Auto dimming screen – after 15 seconds without activity the LCD automatically dims considerably. I often spend several minutes evaluating and adjusting a composition, it drives me mad to be constantly half pressing the shutter to keep the LCD awake. After some research I have found that if you turn ‘Boost Mode’ on the screen will stay on, this is also tied to the refresh rate of the EVF and the autofocus which shouldn’t affect the battery too much while working on a tripod. This just needs to be better documented in the manual. Battery nag – when you use an older NP-W126 rather than a NP-W126S battery a warning pops up every time you turn on the camera letting you know that this battery will deplete faster and boost mode is restricted. Okay Fuji, I get it. No need to remind me every single time, I see the battery indicator is yellow letting me know this already. Too many focus peaking options – I like using the shortcut of pressing in the rear wheel to turn on focus peaking, but I never use ‘Digital Split Image’ or ‘Digital Microprism’. I would like to have the option to turn these off so when I press the wheel it turns focus peaking on or off to the one you like to use. The option to have a ‘clean’ display in the EVF seems to be gone. When evaluating a composition I like to turn off all the display elements (level, histogram, settings, etc.). This is possible on the LCD but it has been removed from the EVF. I wish focus stacking was not part of bracketing. Most of the time I have my bracketing set to focus stacking as I usually take two exposures manually for exposure blending. But, occasionally I need exposure bracketing and it always takes me a minute to remember where I need to go in the menus to change that setting. I would like to see focus stacking added as an option to the command dial similar to bracketing. More crop ratios – I would love to have the option set different crop ratios other than 16:9 and 1:1. You used to have the option of setting 4:3 which I really miss, especially for vertical compositions which are more favorable to this ratio. It would also be great if this was available for RAW only rather than RAW+Jpeg. I would also like to have panoramic ratios (2:1, 3:1, 4:1, 5:1) which can really help to visualize different compositions. Crop ratio by orientation – Related to the last one it would be so nice to have the option to change the crop ratio when you go to portrait orientation since 3:2 is not always ideal for vertical photos. View mode option to have LCD on all the time with eye sensor for the EVF. I often trigger the EVF with my finger inadvertently, but I do not want to shut off the EVF as I enjoy using it. I would love to have the LCD always on, but I when I look through the viewfinder the EVF turns on. This would also resolve the pinch zoom problem mentioned above. There is an option for LCD + Eye Sensor but this only uses the LCD for reviewing images, it does not keep the LCD on while shooting. I still want the ability to set a shutter speed higher than 1/500 in auto iso, this seems like such a silly limitation! The shutter speed in ‘T’ mode is still limited to full stops when you go over 30 seconds, please give us 1/3 stops. The body is almost identical, but it was changed oh so slightly that L-Brackets from the X-T2 will not fit. I previously used the Really Right Stuff L-Bracket on the X-T2 but they did not have them ready when I purchased so I gave the Kirk bracket a try. I must say that I really like it. It is designed very well to be lightweight, solid, and allows full function of your camera. Plus it is $85 less than the RRS so I do not see myself going back. If you’re in the market for a reasonably priced and lightweight system for nature photography, the X-T3 is hard to beat. It is fun to use, the image quality is great, the lenses are incredibly sharp, it has all the features you will ever need. I do not think you’ll be disappointed. If you already have an X-T2 and are thinking about upgrading…it’s complicated. If you use your camera strictly for landscapes, there isn’t a lot to rave about; touchscreen, better low light abilities, a couple million more megapixels. The X-T2 is a great camera and if yours is working well, I wouldn’t spend the extra money. Now, if you do video or any wildlife the X-T3 is a massive upgrade. They have done some astonishing things with both and I would highly recommend upgrading. Great writeup. I sold all my Sony gear and am now a Fujifilm fanboy. I replaced my A7R2 with a GFX 50S, and my A6300 with the X-T3. The plan is to use the X-T3 for backpacking and general purpose photography, and for that it excels. The camera produces beautiful images and I am only slightly disgruntled that I don’t have the GFX when I am perched atop some mountain after hiking for 10 miles lugging camera crap. I have pretty much the exact same setup you suggested. Love the Kirk L-bracket. I have the three lenses you suggested for the lightweight setup, plus a couple of primes. Very happy with the system. Using Capture One Pro and Affinity Photo. Sometimes Luminar and Aurora.